Bad breeding has earned the German Shepherd a reputation for being sickly and dimwitted. Once an icon, bad breeding has earned the German Shepherd a reputation for being sickly and dimwitted. In Germany, police have replaced them with the more aggressive Malinois. But one American breeder is trying to bring classic German Shepherds back. Even though Wayne Curry lives in the American hinterlands, he has managed to acquire a respectable German vocabulary over time. He knows the German commands Fuß! (heel), Sitz! (sit) and Aus! (drop it). Curry loves Germany. He has a Porsche and a BMW in his garage. But most of all, he loves the German Shepherd. He owns a large piece of land in the small town of Rochester, Washington, a one-and-a-half-hour drive from Seattle. The property was once a Christmas tree farm, but now Curry raises and trains German Shepherds there. He left the evergreen trees standing, and now all of his kennels are designed so that each dog has his own Christmas tree to run around. The Germanophile calls his camp "Kraftwerk K9." K9 stands for "canine." His company signs feature the black silhouette of a German Shepherd's head. "I like Germans," he says. "They're my peers. They're competetive. They go to win." 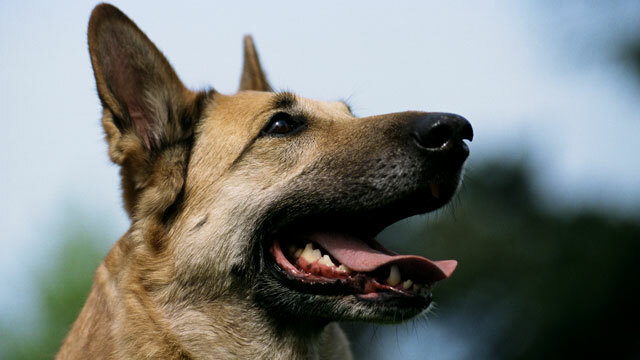 Next to the Labrador Retriever, the German Shepherd is the second-most popular dog breed in the United States. And Curry is the most successful German Shepherd breeder in the country. He has devoted the last 20 years of his life to German Shepherds. He once raised Rottweilers, but it was a long time ago. "They don't stand a chance against the German Shepherd. They take off when they've had enough," he says. And what about the Doberman, the Pit Bull Terrier and the Great Dane? "Not a chance!" he says. The latest copies of Schäferhund Magazin (German Shepherd Magazine) from Germany are on a table in his office. Has Curry heard that there is a passionate debate underway in Germany at the moment over the decline of the breed? And has he heard that German police forces now prefer to work with the Belgian Shepherd, or Malinois? "Excuse me?" Curry asks, with an icy look in his eyes. He composes himself, and then launches into an angry tirade. "Even in Germany they call (the Malinois) a throwaway dog. The German Shepherd can concentrate, but the Malinois can't. And that's time and time again. I wouldn't let a Malinois near my family." And then he adds: "I think it's an ugly dog." Nowadays, one has to travel far and wide to find such an ardent supporter of the German Shepherd. Unlike Curry, German breeders are divided over the question of what exactly makes a good German Shepherd. Purists want to see the breed standard returned to its original form. In 1898, the cavalry captain Max von Stephanitz chose Horand von Grafrath as the first stud dog, and in doing so established the most well-known of all dog breeds. For a long time, Horand's descendants strongly resembled their progenitor. The body was relatively slim and wiry, and the back was straight as an arrow. These animals had all the virtues that helped to make the German Shepherd an icon. Police officers in democratic countries and dictatorships alike have always valued the breed, because of its stamina, reliability and extraordinary courage. The classic German Shepherd became a dubious symbol under the Nazis. For a time, Adolf Hitler had three of his own. He even had an obstacle course built for his beloved dogs at the Wolf's Lair complex in present-day Poland. The Führer's favorite was a dog named "Blondi." Because Eva Braun's terriers "Negus" and "Stasi" ran free at Obersalzberg, Hitler's mountain retreat in Bavaria, Hitler had to beseech his companion to allow him to spend time with his beloved dog. "Evi," he would ask, "won't you allow poor Blondi to spend half an hour with us?" For the last few decades, many breeders have been pushing for a new standard, so that the dogs will look better in shows. A new ideal emerged that defined what an attractive German Shepherd should look like, and it fundamentally changed the shape of the entire breed. Today's model German Shepherd is bulkier than the breed was in Blondi's days, and now its straight back slopes sharply downward. Its curious appearance has earned the modern German Shepherd many a derisive comment. The black-and-brown breed has been mocked as a "hatchback," "carp back," "downhill dog" and "dog in front, frog in back." Helmut Raiser from the central German town of Hannoversch Münden is one of the breed's leading critics. It's a pitiful sight "when a dog doesn't carry its tail held high, and constantly walks around with its rear end tucked in, as if a brick were hanging from its testicles," the dog trainer wrote in the Austrian dog lovers' magazine Wuff. Dog experts say both the appearance and the performance of the former model dog have suffered. "These dogs are too stupid to run away," they say derisively. From the standpoint of veterinary medicine, it's also more than just an aesthetic problem. Nowadays many German Shepherd puppies already show the first signs of future skeletal problems. Veterinarians have developed a promising treatment for another extremely painful condition known as lumbosacral stenosis, a pathological change in the region of the lumbar vertebrae and sacral bone: Using a pin, they fix in place an affected dog's seventh lumber vertebra. This enables the four-legged patient to walk with relatively little pain, although the early invalids are of course lost to the glamorous world of dog shows. When the police in the populous western German state of North Rhine-Westphalia recently decided to do without the services of the sickly German Shepherd, it seemed that the fate of the Teutonic canine had been sealed. They argued that the dogs, with their hip and spinal problems, were hardly creating the impression of dominance anymore, but instead were displaying the placid nature of the more lethargic St. Bernard. Law enforcement officers have recently come to prefer the hyperactive and highly aggressive "Malis," as the Malinois is known in the field. Many officers also believe that this breed is easier to train. But there are still lovers of the classic breed all over the world. Thanks to them, traditional German Shepherds can still command absurd prices. The New York Times recently reported on well-heeled customers who are paying close to $250,000 for individual dogs. Curry's German Shepherd breeding outfit in Washington was also mentioned in the article, which Curry found extremely irritating. "I am not pimp daddy -- I'm not going to pimp my dogs!" he says. But Curry knows that fortunes are being paid for individual dogs. German Shepherds are particularly in demand in China at the moment. Curry himself has already received offers from shady individuals, but he says that he has turned them all down. He says his motto is: "Put the money outside and live like the poor guy." He learned his trade from older breeders in Germany. "They are tough guys, man," he says. He used to play drinking games with the veterans until well after midnight. Eventually the Germans revealed their tricks to their strange American friend. Maintaining Quality For instance, they taught him how to keep a lineage stable. Curry doesn't mate his magnificent stud dogs with just any female to produce as many offspring as possible, a common practice among many younger German breeders -- and one that produces poor results when it comes to quality. "I don't make a low-level German Shepherd either," he says. A descendant of Irish immigrants, Curry also has an extremely valuable advantage over breeders in Germany. For example, he can have the sperm of his top stud dogs frozen and then use it when needed. The Association of German Shepherd Dogs (SV) prohibits artificial insemination in its breeding rules, which state: "Puppies that are produced in this manner are not accepted into the studbook or the membership registry of the SV." Sperm from several of Curry's breeding dogs is stored in a laboratory in nearby Portland, Oregon. "My line will never die out," says Curry. The undisputed alpha male in his pack is "Oruger," fondly known as "Rudy," a jet-black beast that looks frightening enough to terrify any Little Red Riding Hood lost in the woods. The pack leader spends most of his time lounging on the floor in his master's house. But when given the right command, Rudy can bark himself into such a frenzy that foam begins to drip from his snout. Experts distinguish between show and working dogs. In Germany, the interest of breeders has shifted almost exclusively to show lines: dogs with extremely limited capabilities, whose existence is justified solely by mindless 15-minute appearances. These dogs are not suitable for police service. Nevertheless, the offspring of champion show dogs command a high price. Training Techniques Working dogs like Rudy couldn't even win an honorable mention at dog shows, and yet every police officer would be happy to have a guard dog like Rudy at his side. Training these German Shepherds is time-consuming, and it takes strength and determination. Curry doesn't do it alone. His business partner, Anthony Akers, is a member of the Marine Corps and spent several years in Afghanistan, during which he saw three friends die. Like many elite soldiers, he has a Shakespeare quotation tattooed on his forearm: "Cry havoc and let slip the dogs of war." "Tony isn't afraid of anything," says Curry, which is why he has a special responsibility at the training facility -- to sharpen Rudy's instincts as a fighting machine. After a training session, Akers' arm is covered with bruises, despite the protective sleeve he wears. "Rudy could rip off your arm if you let him," says Akers. For Akers, dog training isn't some militaristic macho game. The soldiers Akers saw die in Afghanistan were killed in attacks with explosives. The military dogs should have detected the bombs, he says. He and his mentor, Curry, are convinced that dog handlers often use the dogs incorrectly, with devastating consequences. "They put the dogs on a leash, and the handler determines the direction. The dog would go in a different direction if he caught a scent, but when in doubt, of course he'll obey his handler," says Curry. Forgiving Nature To address this problem, Curry has developed a training method that focuses entirely on the dogs' unique sniffing ability -- and dispenses with human handling altogether. He has built a course with small metal boxes installed at various heights. The German Shepherds are supposed to find a pistol that is hidden in one of the boxes, which could just as easily be used to hide marijuana or explosives. A metal tube is mounted above each box. If a dog has sniffed out the right box, Curry, who is out of the dog's sight, presses the button on a remote control. The metal tube opens and a rubber ball -- the dog's reward -- drops out. "It's important to divorce the handler from the reward. The dog has to learn to rely on itself," the trainer explains. But this goal has often been ignored in other training programs, says Curry. "Instead of following their instincts, what the animals learn is: 'I'll get something if I do my master a favor'." According to Curry's philosophy, the human being is always the weak, and never the animal. "Nobody is a perfect dog trainer, everyone makes mistakes," he says. "The dog has to forgive me, so the forgiving nature of the German Shepherd by itself is enough." +Why Do People Own Exotic Pets?